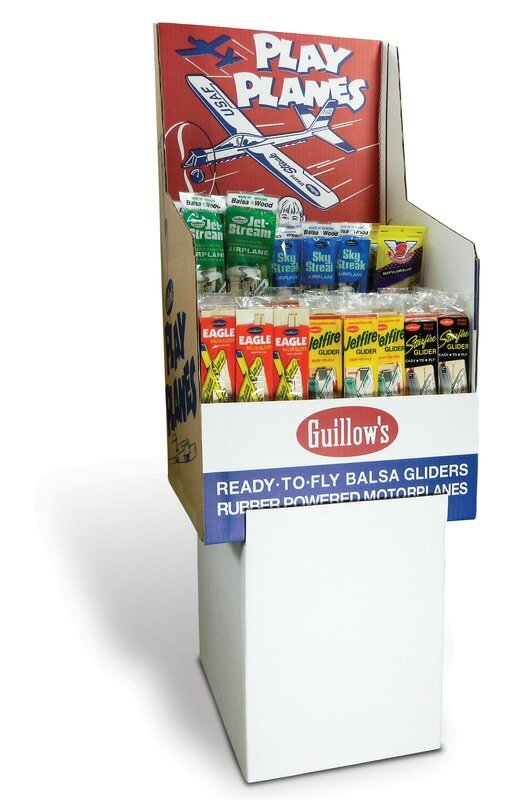 Our toy glider products are great "impulse buy" items and we have many different displays for stores. 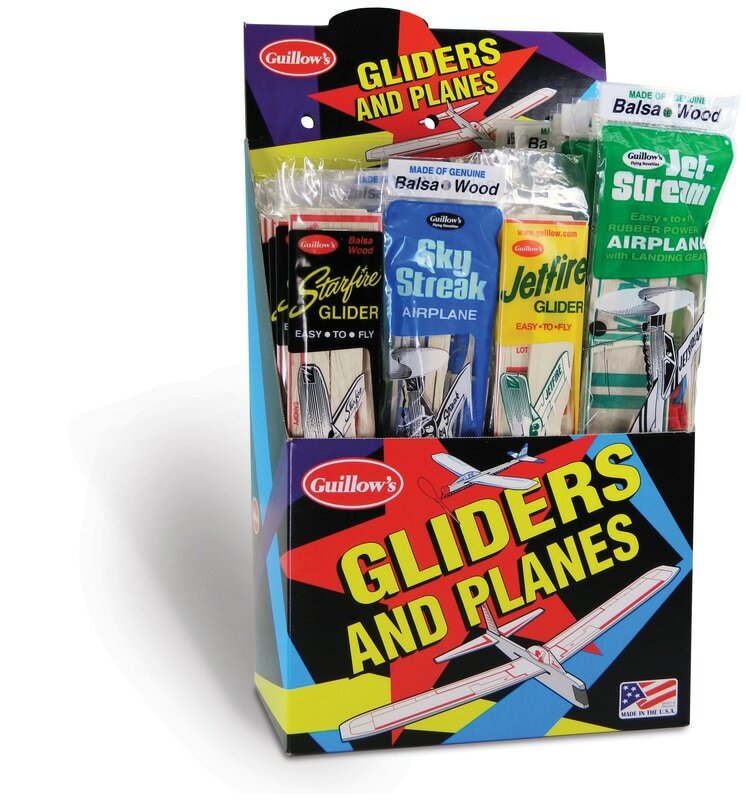 Our colorful balsa gliders can be on a shelf next to the cash register, hanging on a pegboard display or assortments in our large floorstand displays. 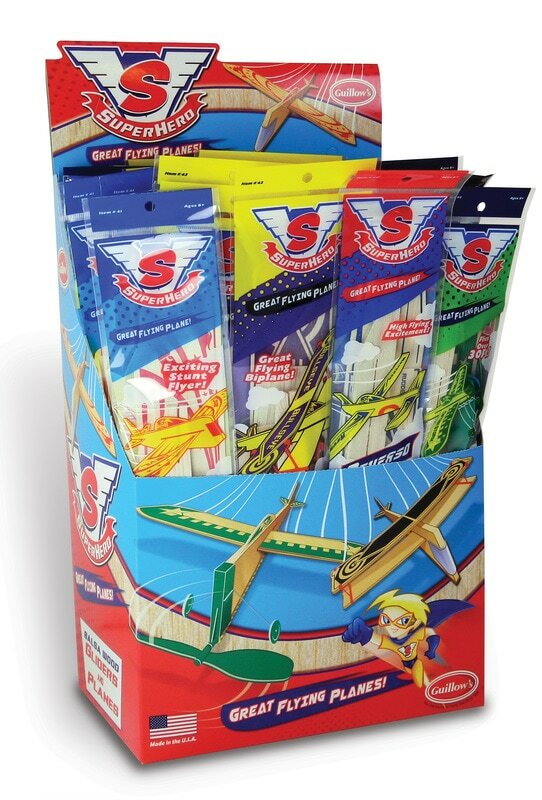 Super Hero balsa airplanes from Guillow's soar into the sky! A child's imagination will have these colorful toy planes batteling 'good vs evil" as they zip and loop around the backyard. Four different airplanes, a new reverse flying canard glider, our customer favorite 12" glider, a nostalgic biplane and a propeller / rubber motor powered motorplane. 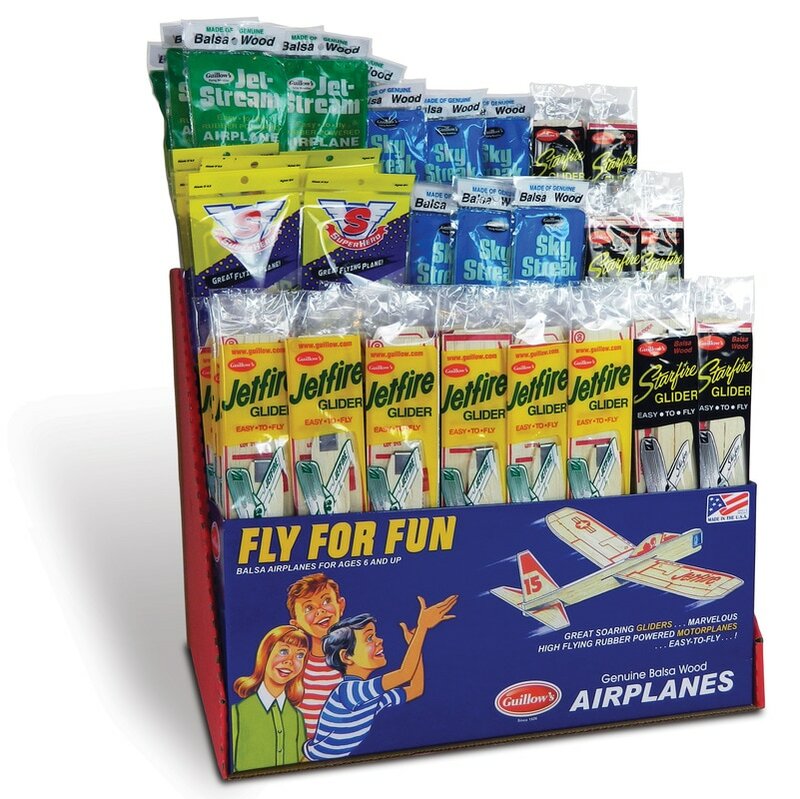 Each of these new toy airplanes have colorful polybags that fit into this Super Hero Display, a fun assortment pack display for your store shelf. Our most popular glider is now in a compact low counter display. Designed for limited space areas, display can be used on shelf or hung on pegboard hooks. 18 Jetfire gliders make for quick turnovers. Our most popular motorplane is now in a compact low counter display. Designed for limited space areas, display can be used on shelf or hung on pegboard hooks. 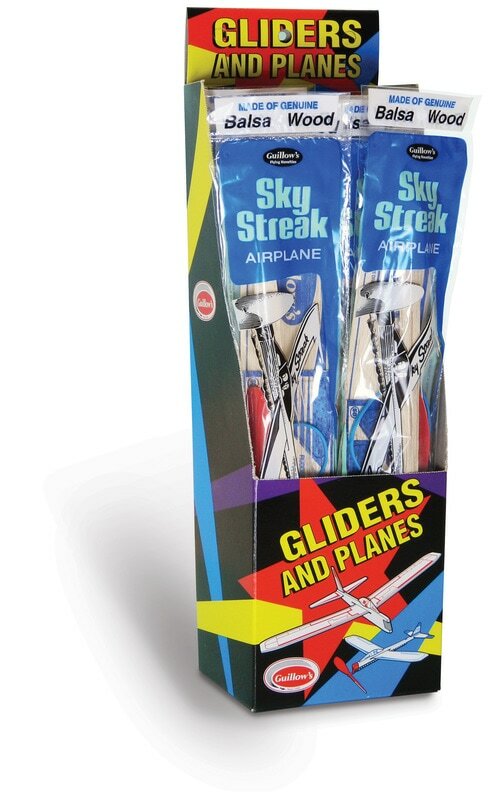 12 rubber powered Sky Streak motorplanes make for quick turnovers. Proven sellers! Two different hand launched gliders and two styles of propeller driven "wind-up" motorplanes. All low priced & packed in a compact display designed for either counter or toy rack use. 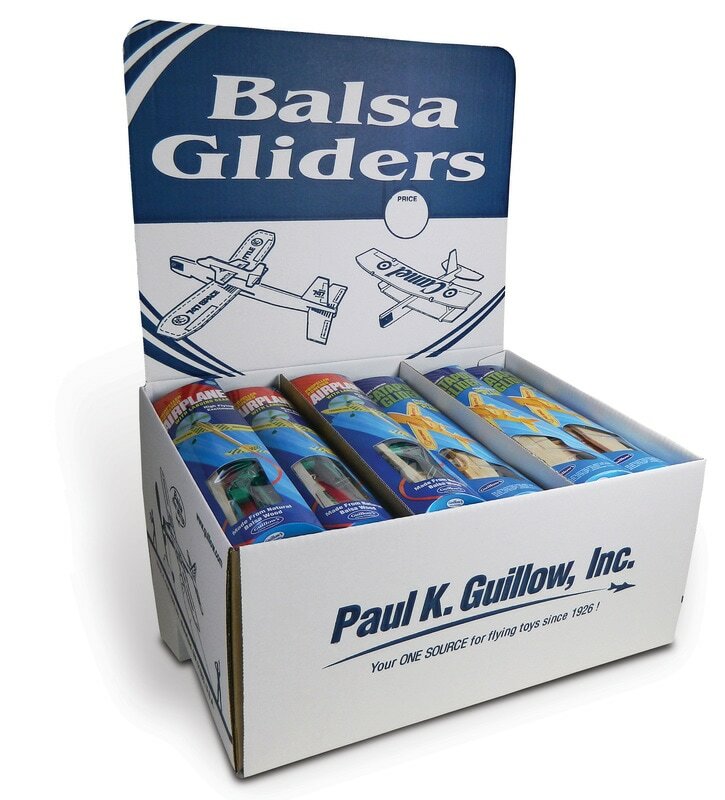 A great assortment of best selling Guillow easy-to-fly balsa wood gliders and rubber powered motorplanes. All packed in a compact box adaptable for either shelf or pegboard rack use. 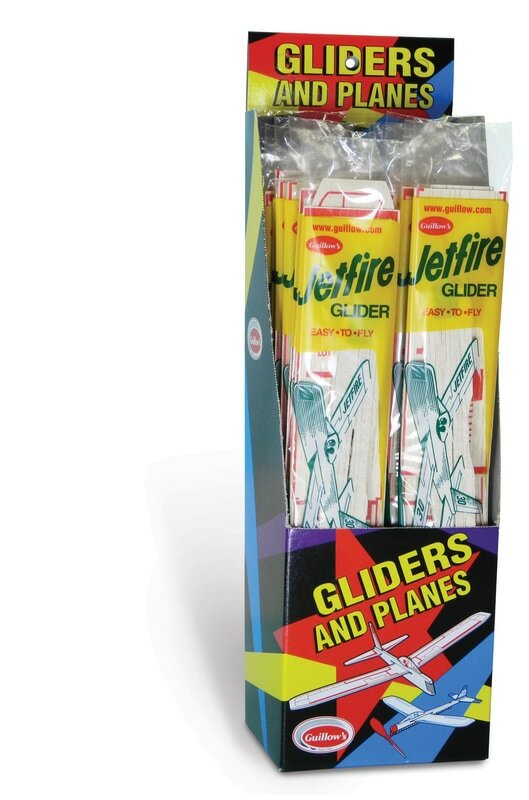 Gliders in protective packaging. A compact assortment of novelty oriented easy-to-fly airplanes in unique full color pillow packs. "Hang Me Anywhere" display, a popular concept in glider merchandisers. 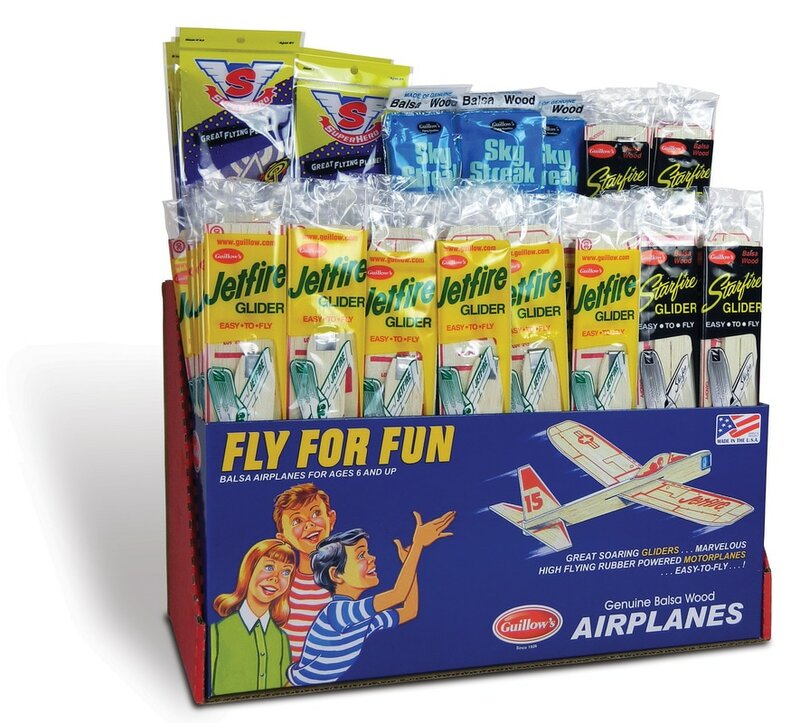 Neat two tier display containing 7 dozen easy to fly balsa gliders and motorplanes. Only takes 43.18cm x 21.59cm or counter space, or 43.18cm x 41.91cm of pegboard area. Hanging ties and instructions included. Compact - colorful! A three tier display similar to the No. 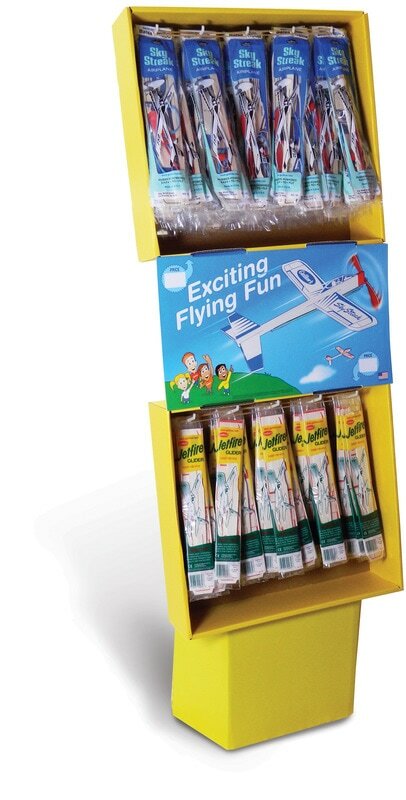 81 containing 10 dozen easy to fly balsa gliders and motorplanes. A fine assortment taking only 42.55cm x 31.12cm of counter area, can also be used on pegboard display. 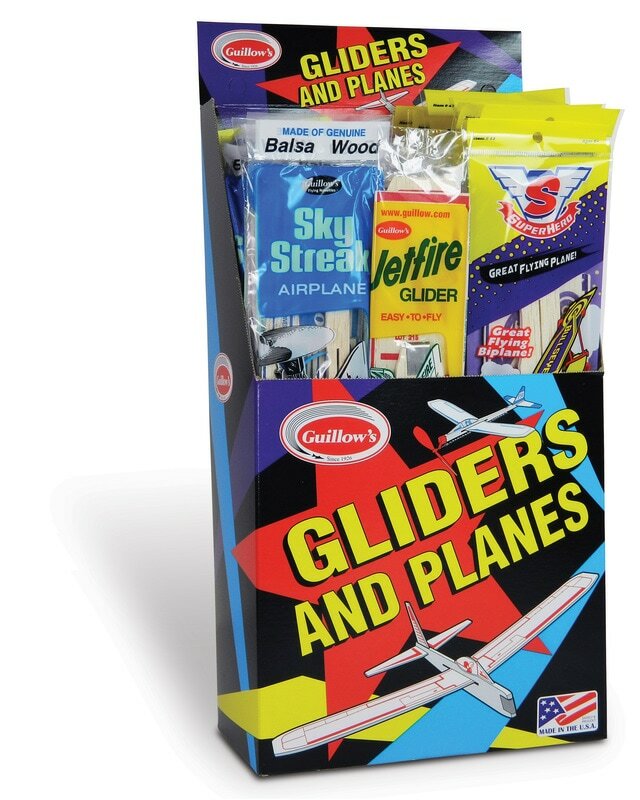 Our most popular floorstand display with a large assortment of hand launched and rubber powered motorplanes! Case Cube: .069 cu. m.